Home > KMS	> Inkwell’s Secret Diary – The Wait is Over! Inkwell’s Secret Diary – The Wait is Over! A new entry has been posted, titled The wait is over! I guess adventurers and the Resistance will be receiving their Hyper Skills much sooner than expected! I guess this is the Hero Hyper Skill? I can’t wait to see what Bowmasters will be getting, haha. Everyone also receives a free Character Slot~! Yay, now I have 14 slots in total. They’ll definitely have to expand the maximum number of slots again soon with all of these new jobs coming so fast. The final part is the Hero bonus! Any Hero character that has been created during this event will receive special Cash items as well as an Exp 70 potion at level 70! Cheated to 2nd u all hoars. Well, IMO, the HS of a hero looks to… kaiser-ish if you know what I mean. wait tell me again…. can Arans share cs items with other arans? I tried it a while back, having my main aran and a mule aran. No it does not work, unfortunately. Wait so older Hero classes don’t get the free cash shop items? ;so much fire…. could be the paladin hyper skills using the flame charge? You honestly don’t know what a Paladin. You do know that paladins use swords too. One handed is only used for defensive purposes. consider that because paladins can use four different elements, the animation changes depending on the element. I suggested it could be a Paladin hyper skill because look at all the fire. Heros so far have just used some power swords. so yeah, LOL. The Heros new 4th job attack is a flaming sword, plus paladins are more associated with hammers. uh paladins can use 1h and 2h bw and swords buddy. Heroes havent exactly shown any flame. That is afire based attack. Go on. take a look at it carefully. and recall that maple input the sword animation for the charged blow attack before the mace. yeah. paladins are associated with maces alright. 1. The sword is from Intrepid Slash. 2. The new 4th job skill has a flame like the hyper skill. No, this is clearly a skill for Heroes. I know people are knocking down this notion but I’m with you and everyone else that thinks this is still up in the air. This can be either a Paladin or a Hero. Though as some others have mentioned Heroes are dubbed as sword users more often than Paladins in the eyes of Nexon game developers. Also Heroes have more popularity than Paladins as well. That’s just based on past results but the fire makes me pull for Paladins so much. I’m crossing my fingers for them. Why do evans that are made in the event have to get it I already have an evan. Can’t wait for Shadower’s Hyper Skill…. Are the cash items permanent ? The Cash set they gave for Angelic Burster was permanent so I believe these will be too. That’s what I was thinking actually..
…So the heroes already made don’t get the CS stuff? Though knowing GMS we probably would have had to spend NX for those. The cash items for the Heroes is permanent? Make a second Aran and move it through the cash shop! Are these CS items available to those who already have an Aran, Evan etc. in 120? 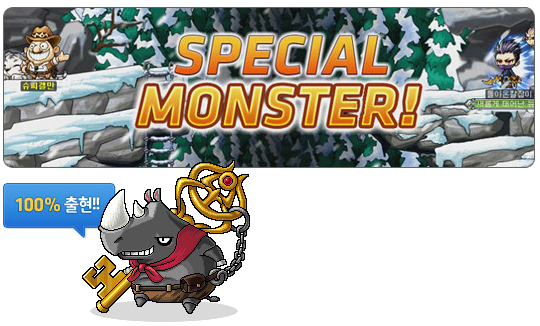 Umm… guys… take a look at the picture that says “Special Monster”. The DB in the picture is wearing a medal that says something like “Newly Born” could this be the medal adventurers and DBs get in an upcoming event? I fso, this could mean that DBs and Cannoneers are coming back! I think all classes will come back for the Hyper Skills, though is kinda annoying the “You’ll never have anymore, well maybe one more time” thing with the classes, is reasonable they coming back for the hyper skills, for a short period of time. max the bottles dont expire right? can the items given on the Hero Bonus be shared in any way, karm/sharing tag? can the items given on the Hero Bonus be shared, karma/sharing tag or anything else between characters? They’re regular Cash items, so nope. @Max, can you still get the aran clothing if you’re pass level 70? The notice said specifically “for characters created from September 7 to 20” so I doubt it. OT: In regards to the Hero bonus… When you say “Any Hero character that has been created during this event,” does “this event” mean Tempest up until now, or only Hero characters created after the Maple Style event began? -Anyway… That probably is the Hero’s Hyper skill. In my opinion is ok.. They could have done better. I hope you don’t mess with mages Nexon! Oops. I see it, now that I reread the post. I thought you said only the EXP 70 Potion was recieved at LV. 70… That clears up a lot. Thanks for the replies, Max! hey Max if you were to create a hero and get the cash shop bonus, if you already have a character like that (lets say phantom) can you transfer the cashshop gear like the garnet raven persona and garnet imperial overall? i meant if you already have a phantom. you make a phantom get the cash shop stuff, can you transfer it to your other phantom? Yep that’s the set effect for the Garnet Phantom set~ I don’t know if you’ll get it with only two equips though. Holy hell yes! Now that’s what I’m talking about. Still, can’t wait to see Bowmaster’s Hyper Skill. Long time reader, first time poster. You get a lv70 exp potion for the first hero, correct? Would the following line of thinking work: Get your first hero to 70>get the exp potion>use it to level another hero up to 70>get another lv70 exp potion>rinse and repeat? Ah, one could hope. It’s just that I already have all the Heroes that I want at pretty nice levels, and redoing my (at that time) lv90 Dual Blade for the recent GMS event took a toll on me. Oh well, it’s just some silly CS looking items anyways. Battle Mage’s Hyper Skill better involve some mass-mobs face smashing. Has the 1+1 event started yet? I just got my phantom to 70 today and i havent received the potion. I just made the phantom yesterday. Thanks in advance. Hmm… it says you’ll receive the Cash equips on the 23rd so maybe you’ll get it then? As a fellow hero, I don’t really think that this is our hyper skill. In fact, I think that its our friend, Kaiser’s Hyper skill. Even though the one who uses hyper skill in the picture is using two handed sword ( which could be hero or kaiser OR paladin ) , its too flamey for it to be the hyper skill for hero. But take note that Kaiser already have their hyper skills. So another mystery to be solved… Great move nexon. Great……. well people thought of that since the word used was raging BLOW. charged blow. sword attack. see how one could make the connection? big bang kamehameha times 100!!!! I’m more looking forward to Dual Blade’s Hyper Skill… Just you wait… The Dual Blades will be back once more!!!! it will likely just involve a bunch of chains shooting across the screen. haha. Max, if we created a hero during the event would we be able to move the CS items over? So if i made an evan and got it to lv70 could i move the items to my other Evan (using the cash shop inventory)? I’m not Max, but if you read the previous comments, you’ll see that this has already been answered. Evan characters each have their own individual cash shop wardrobe. You can’t transfer between two Evan characters. are the cash items limited time or permanent? oh and are they completely untradable? Nifty explosive sword Hyper Skill…Braver much? Most people probably didn’t get that reference, lol. “Braver” is the main character’s first “super attack” of sorts, which is basically the shown Hyper skill above. Is the cash items perm? PLEASE LET DK SUMMONS A DRAGON ALREADY !! what is that 2 pink feathers item under setup?????? WAIT!!! So aran is a guy again? No I think that was just an example of what the cash shop equips looks like. Thats not what mercedes looks like either sooo..
Is the cash equipment permanent? Its so unfair!!!!WHY!? Its so unfair!Ive put so much effort into all of my heroes,and now i have to delete them and restart to get those nx items.Because i wont give up on a cover finally for czak helm and some nice looking :[ ,i wont delete my mercedes,phantom(or will i? ),luminious(-sigh-) but i will delete evan and aran to get those…goodbye rare items. I find it funny that you guys are just realizing this? I tried this out as soon as Knights of the Cygnus were made. Previous to them there were only adventurers and everything could swap. I tried every new class to see if things could swap between the new exclusive class. No, each new class has a cash shop inventory exclusive to that particular character; not the class. hey Max, do you know what this is? nvm, saw your latest post. A bit late for this, I’m sorry. Max, do you know if the Aran Cash Shop items are able to be bought outside of the event rewards? 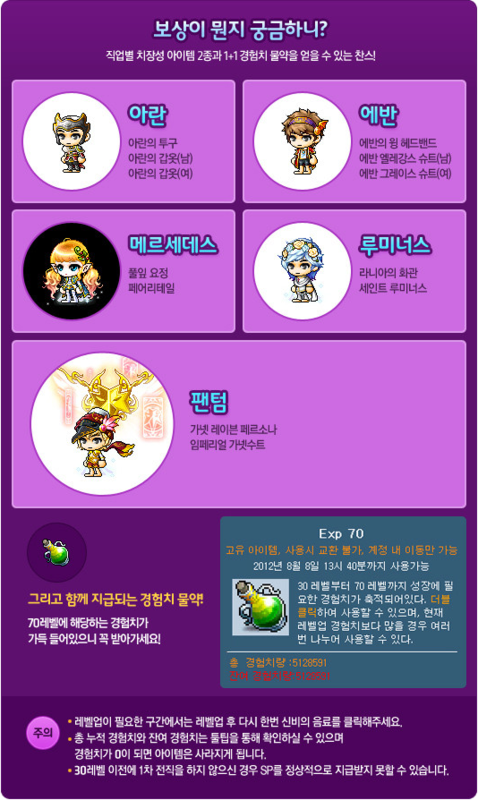 kMSt ver. 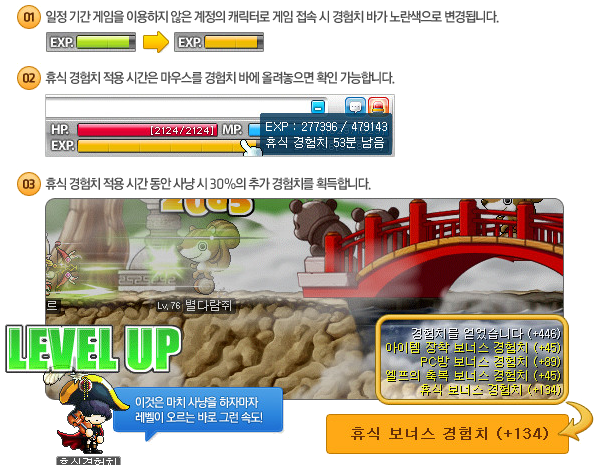 1.2.450 – Warrior and Magician Hyper Skills & Evolving System~! kMS ver. 1.2.172 – Maple Ghost School & Star Star Festival!